AssoTaxi we offers the easiest, quick and cheap to find a taxi immediately telephone waits ne time losses. Much more than they can offer you a simple radio-taxi. Taxi-SMS is a unique research system, fully automated taxi. nothing wasted time because you have the results of research of taxi in only 100 seconds. coast as an ordinary SMS, less than usual and long wait on the phone for regular radio-taxi. the system is fully automated and is available 24 h a day, 365 days a year. the taxi driver will kindle the taximeter "only under your door," adding, once arrived at your destination, only 2 euro for the call, as from municipal fee, irrespective of the time of arrival, with considerable savings of money. why is the easiest and cheapest on the market today, and with reduced management costs allows us to offer you cheaper rates. anyone is able to do a SMS. who doesn't want to or can't waste time on the phone with the usual radio-taxi. who wants to try something new, efficient and transparent world Taxi. 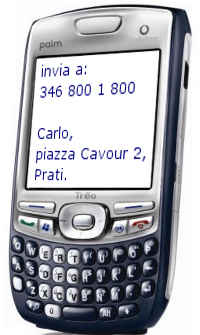 make an SMS with the text: "CIVIC ADDRESS NAME and ZONE" for example: "Carlo, piazza Cavour 2, Prati"
mail it to the number 346.800.1.800 .
the computer system you immediately responds with another SMS within 48 hours either confirming started searching. in only 100 seconds another SMS you confirm the results of research of taxi!